For a stylish & Efficient Kitchen! Chicken, fish, meat, and vegetables cook to perfection fast. Helps tenderize economical cuts of meat. Strong heavy-gauge aluminum for quick, even heating. Works on regular and smooth-top ranges. Pressure regulator maintains the proper cooking pressure automatically. For a stylish & Efficient Kitchen ! The smart choice for healthy, flavorful meals, fast and easy. Foods cook 3 to 10 times faster than ordinary cooking methods, saving time, energy, and money. Includes easy-to-follow instructions and delicious recipes. Chicken, fish, meat, vegetables, and even desserts cook to perfection fast. Helps tenderize economical cuts of meat. Strong, heavy-gauge aluminum for quick, even heating. Suitable for use on regular and smooth-top ranges. Pressure regulator maintains the proper cooking pressure automatically. Cover lock indicator shows if there is pressure inside the cooker. Special rack included for cooking several foods at once with no intermingling of flavors. Helper handle for ease of handling. Fully immersible and dishwasher safe with the sealing ring and over-pressure plug removed. This pressures cooker from “Time Saver”will last a long time and is dishwasher safe. The Ebonite handles further ensure that you have a tight and comfortable grip that makes it easier to use as well. 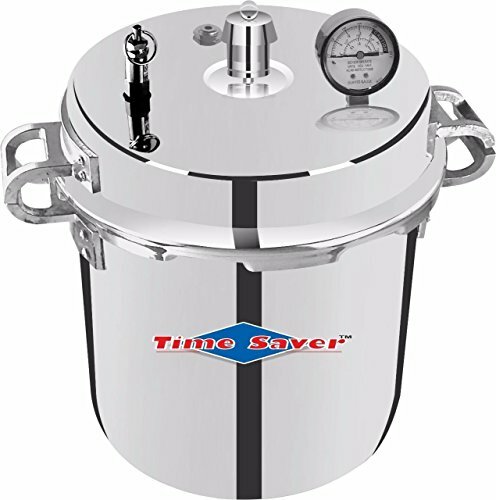 The Time Saver Aluminium Pressure Cooker comes in a very attractive finish making it suitable for any kitchen. In fact, it has such a unique design that it will perfectly compliment the modern kitchen with its Silver color. The finish on the product is top notch giving it a very polished look. Helper handle for ease of handling. Also includes a special rack for cooking several foods at once with no intermingling of flavors. This pressure cooker is useful for weeknight dinners or for any meal that needs to come together quickly. Please let me know if you’re looking for a writer for your blog. You have some really great articles and I think I would be a good asset. If you ever want to take some of the load off, I’d really like to write some articles for your blog in exchange for a link back to mine. Please blast me an email if interested. Thanks!